You might be wondering how to increase your site’s visibility online without wasting money. So how can you land on the first page of Google search results? It turns out, there is a way to quickly increase your website’s online visibility and attract real human prospects (not bot traffic) to your website. We recommend taking a look at Google Adwords. 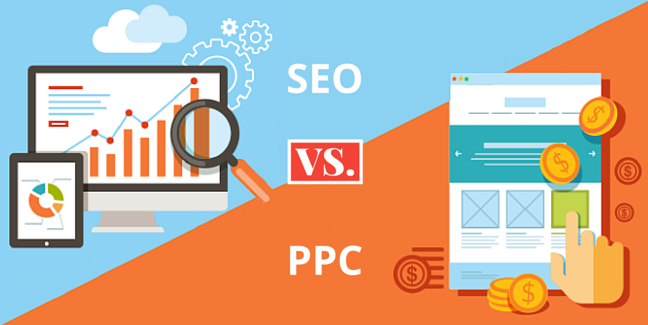 Read more on SEO vs Adwords here. How Does Search Engine Advertising Work and How Do I Advertise on Google? First Thing’s First: What is Google Adwords? Google Adwords is an advertising platform. Whenever you see search results in Google with advertisement boxes at the top or right side of the screen, or open emails in GMail and see a banner at the top or boxes on the right-hand side of the screen with advertisements related to the content of your emails (which is absolutely terrifying), these ads are being served to you from Adwords. Adwords is a bit complicated in its structure. It’s more than “I pay $1,000 and Google puts advertisements randomly on the Internet.” If you look at a Google advertisement, it becomes clear that these ads are being targeted specifically to your search or to the contents of your email. And, some advertisement boxes show up on the first page of search results while other advertisements show up buried on the third or fourth page of search results. This is not accidental. How Do They Advertise Directly To Me? Longer answer: a complex algorithm . . . and magic. Every time you search for something in your search engine, whether Google, Yahoo, or Bing, you’ll likely see ads on the page (if you don’t have an ad-blocking tool). Ads are served up to you in an instant. But how this works requires a bit of explanation. First, the search engines take the text of your search term (called “keywords”) and sends this to the advertising network (Adwords). At Adwords, different advertisers (companies offering products or services related to the keywords) pay for ads based on keywords. Once Adwords receives the keywords, Adwords takes the advertisers’ ads and sends them back to Google. When your page loads, you end up seeing ad boxes from the advertisers placed into the search engine results page by Adwords. Every time someone clicks on one of your ads costs you money. This is referred to as Cost-Per-Click or “CPC.” For each keyword, there is an associated CPC rate. This rate is determined by a bidding system within Google Adwords. It is advertising capitalism in its purest form. Whoever pays more for the keyword CPC gets better ad placement. Search for a keyword in Google. Search for “Personal Injury Attorney [your state].” If you don’t have an Ad-block tool, you’ll see that there are boxes on the top and right-hand side of the screen advertising attorney services. Many different law firms are vying for your business when you search for “personal injury attorney [your state]” because they know you’re looking for their services. Their goal is to get your business. So, they have to bid against competitors to have their advertisements featured more prominently than their competitors. If I am willing to pay more per-click than my competitors for the keyword “personal injury attorney [your state]” then my site is featured more prominently by being listed first. How do I set up an Adwords campaign? Here are step-by-step instructions to help you through the process. Go to Google.com/adwords. Sign up for an Adwords account. You do not need an @gmail.com e-mail address to sign up. First you will need to create a name for your campaign and set a daily budget. Each campaign is broken down into “Ad groups”. When you create an ad group, you will need to create the text for your advertising boxes that will appear in Google search results for people typing in your keywords. Destination URL – the actual location of the link. For example, your Display URL can be your main homepage, but you may want your destination to take the user to a Contact page or Marketing page. Now you need to pick your keywords that will lead customers to you. In addition to using the on-screen keyword generator, I recommend using Google’s heavy-duty Keyword Tool. To do this, go to the top of the screen, going to Tools -> Keyword Tool. Using this tool you can type in keywords you are interested in and the tool will suggest keywords you might be interested in. If I type in “personal injury attorney” it will show me results for estimated traffic for that keyword, but also suggest I use “personal injury lawyer” as a keyword. For a more thorough explanation, check out this article on how to use the Google Keyword Tool. Aside from the Keyword Tool, Google provides some assistance helping you come up with potential keywords in the keyword section of the Adwords campaign manager. Next you need to set a budget, determining how much you are going to pay per click. You can adjust your max CPC by individual keyword or the ad group overall. For more helpful information, check out Google Adwords Walkthrough. And that’s all there is to it. In no time you’ll be up and running with new visitors coming to your website. Be sure to monitor your Google Adwords campaign constantly so you do not end up spending more money than you budget for. It’s important to also monitor your AdWords campaign to observe whether the price you’re paying for clicks is resulting in conversions and whether you are earning a return on your investment.